Epoxy floor coatings in Carefree can transform your drab concrete floors into glossy, polished floors that make any space look more elegant. You can turn your dusty, dirty garage into a professional-looking work space, or you can turn your dull kitchen into something worthy of a top chef. You can make a significant change with a simple floor coating applied by a professional. Epoxy coatings contain pigments that are fire retardant. When they are exposed to heat, they expand, thereby protecting the floors from burning and other heat damage. Fires will burn out naturally on the floors if they are protected by the coatings – assuming the fire doesn’t spread to any other nearby materials. The heat resistance makes epoxy coatings a good choice for kitchen floors, as well as for industrial floors. High heats from the stove or industrial equipment can lead to fire, which can spread to the floor. Burns are not the only kind of damage the epoxy floor coatings protect against. The coatings form a protective barrier for all kinds of corrosive elements, including strong chemicals used in the manufacturing process, oil and gas found in garages, and more. These floor coatings also protect against scratches, scuffs, and other marks. Epoxy floor coatings aren’t force fields for your concrete floors, but they will keep the damage to a minimum, which will make your floors look great and last longer. Concrete is strong and not easily damaged, but it is not invulnerable. Concrete is porous, so it allows in water and other liquids, including automotive fluids, oil, and chemical solutions. Even simple water can wear down the surface of your concrete floors over time, creating cracks that eventually become holes. Water can also make the surface of your concrete floors rough, which will make them look terrible and will create a safety hazard. Epoxy resin creates an impervious barrier that keeps these liquids out and protects the sanctity of your concrete floors. So long as the floor coatings are maintained, you won’t have to worry about water damage to your floors. You may have several options for refinishing or replacing your floors, but Carefree epoxy floor coatings can give your floors a whole new look without much time or investment. Epoxy floor coatings can adhere to many different surface types, so they can be used on almost any floor you may have in your home or place of business. These coatings can be used on more than just concrete, but they are an especially good choice for concrete because of the way they can transform the drab surface and protect the floors. Epoxy can be mixed with many other materials to create different looks and effectts, which makes these floor coatings especially versatile. The epoxy can be mixed with different stains and aggregates to take on different colors or to have different textured looks. The coatings can have a shimmer, a swirl or cloudy effect, a pebbled effect, and more. Of course, you can also choose floor coatings that are plain and clear, and they will polish up the concrete and instantly elevate the look. Epoxy flooring is a great investment for your home or your business. It has numerous benefits, and it comes at an affordable cost. With the ease of maintenance, improved look, and protection that the epoxy flooring provides, it offers a great return on your investment by increasing the value of your property. 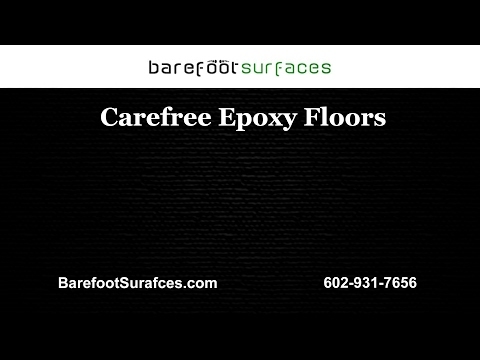 Barefoot Surfaces is a trusted epoxy flooring contractor in Carefree, Arizona that services residential and commercial properties. We install decorative concrete overlays, metallic epoxies, stained concrete, and garage floors. In addition, we install garage cabinets to make your space look professional and organized. We help you choose the best floor coatings to create the look you want and to protect your floors against known threats. Contact us in Arizona to learn more about our services or to schedule an estimate. You can view examples of our previous work on our website, as well.